This title is misleading. 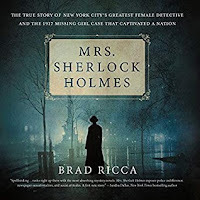 It has nothing to do with Sherlock Holmes, and the intro is about Holmes, and has even less to do with the overall book, so just ignore that. This is a biography of Grace Humiston, a lawyer who became a default detective, and was sometimes called "Mrs. Sherlock Holmes" in the newspapers because of her ability to solve cases no one else could. But it wasn't by her powers of deduction at all--in fact she dismissed those. It was due to diligence, determination, and mostly the willingness to put in the hours and follow all the leads. She wasn't on the police force nor a private detective. She ended up investigating cases because of her work as a lawyer. Mostly her detecting was done to clear the names of defendants she represented. But boy, did she get it done. And as a woman lawyer in the first couple of decades of the 20th century, she got a lot of press doing it. The main case the book follows is that of the disappearance of teenager Ruth Cruger in New York City. It was one of those stories that captured the nation at the time (although I'd be shocked if anyone had heard about it today outside of this book's readers and her family). The book picks up and puts down Ruth's story several times, in a way that is a bit disjointed and as a listener, had the potential to be rather confusing. It managed not to be, but I'd have rather had the story laid out in a more straightforward way. But poor Ruth did keep a through-line in the narrative, and boy, Mrs. Humiston was a fascinating woman. Today she probably wouldn't have stood out at all, except that as a boundary-pusher, she might have been still famous as a feminist, pushing things that much further. Of course we'll never know. But she fought for the rights of workers, of immigrants, of women, and pretty much anyone downtrodden or put upon. It's hard not to like her. This was an amusing distraction and I learned some localized history as well. The print version of this book is published by Macmillan, my employer. I downloaded the eaudiobook from my library via Libby.